Punjab PMET Result 2016: The Punjab Pre-Medical Entrance Test commonly known as Punjab PMET. The PMET is conducted to provide admissions to the students willing to do MBBS and BDS courses in various medical colleges. The PMET (Punjab MET) exam was successfully conducted on June 11 at 33 test venues set up across 15 places in the state for admission to approximately 800 MBBS seats in 8 Medical and 1200 BDS seats in 11 dental colleges of Punjab. A total of 14,689 candidates wrote the test this year out of around 16,000 who had registered. 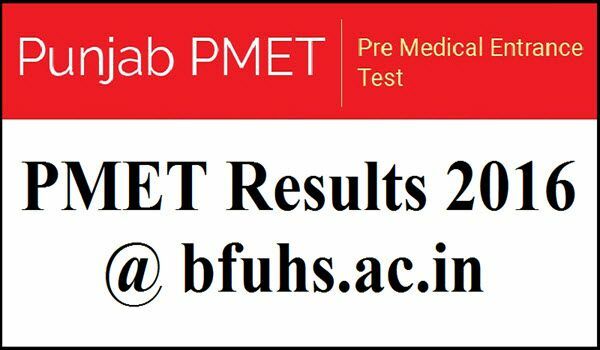 The Baba Farid University Of Medical Sciences is likely to declare the P.MET entrance exam results on June 22, 2016. Check out the below article to get the full information regarding Punjab PMET 2016 Results Name Wise and How to Check it. Name of the University: Baba Farid University Of Health Sciences. PMET (Punjab PMT) was held on 11 June at 33 test venues set up across 15 places in the state. As said by Anil Joshi, medical education minister of Punjab, a total of 14,689 candidates wrote the test this year out of around 16,000 who had registered. The minister expressed his satisfaction over the successful conduct of the test and also congratulated Dr. Raj Bahadur, the VC of BFUHS and all other associated with the conduct of the test. It is also reported that in the first shift (10 am to 1 pm), nearly 560 candidates remained absent. Likewise, absent was recorded in the second shift too, held between 2 pm to 5 pm. The test was conducted in two shifts and in total, 7292 candidates wrote the test in first shift whereas 7397 candidates appeared in the second shift on June 11. How to Check PMET Results 2016? You can find a direct link over there. Click on the PMET 2016 results and then click on the individual result. Download / Take a printout of Punjab PMET Results 2016 for further reference. Stay tuned to this website. We will update Punjab PMET 2016 Toppers, Merit List, Counselling details. Hope you like this Punjab PMET Results 2016 Name Wise. If you like this please share it to your friends who are eagerly waiting for PMET Results 2016.